The Korbinites are an alien species in the Marvel Universe best known for the character Beta Ray Bill who is there protector. Appearance: Many mistakenly believe that Korbinites look like Beta Ray Bill this is not true. Beta Ray Bill is actually an artificially created body made up of a carnivorous beast that had been genetically and cyborgnetically altered. Beta Ray Bill can change himself into this super form when he needs to. The real Korbinites are much more human looking. Korbinites have light orange skin. They are humanoid with 1 head, 2 arms and 2 legs with 5 fingers and 5 toes on each hand and foot. They appear to be hairless. Korbinites have adapted to a far warmer climate than Earth. Technology: Korbinites have advanced technology that greatly exceeds that of humans on Earth. They have advanced cybernetics, space (Warp Drive), and genetic technology. Many or all of their technology is used to create the super body of Beta Ray Bill. Korbin was destroyed by a cataclysimic event that was somehow created by the Asgardian Demon Surtur. The peaceful empire of the Korbinites was forced to flee Korbin and their other planets in space ships. Their flagship is called the Skuttlebutt and this is the primary ship of their protector Beta Ray Bill. Beta Ray Bill - By far the most well known Korbinite is their protector Beta Ray Bill. While Beta Ray Bill has fierce, violent and bestial image he is a noble warrior with a similar set of powers of Thor. Ti Asha Ra - A new Korbinite female recreated by Galactus to serve as Beta Ray Bills companion / mate. Are the Korbinities in Guardians of the Galaxy movie? 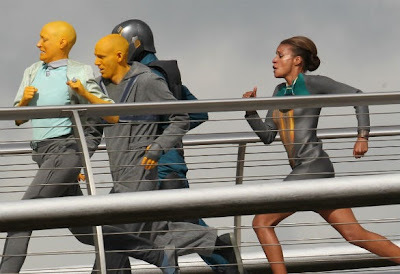 There are orange skinned people on Xandar who appear to be Korbinites. The name Ti Asha Ray also showed up on a call sheet. Ti Asha Ray shows up in a few comics as a Korbinite female leader. In one story she is resurrected by Galactus and she is the last Korbinite female in existence. There is also a figure standing in a cube of the warehouse of the collector that is wearing a cape and look like Beta Ray Bill. See the Post below for more information on this.